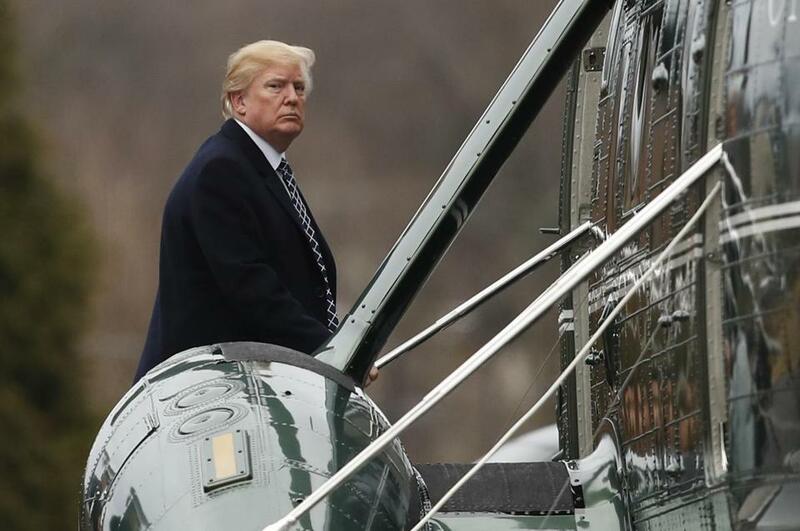 President Trump boarded Marine One as he left Walter Reed National Military Medical Center in Bethesda, Md. WASHINGTON — President Trump offered a partial denial in public but privately defended his extraordinary remarks disparaging Haitians and African countries. Trump spent Thursday evening calling friends and outside advisers to judge their reaction, said the confidant, who spoke on condition of anonymity because he wasn’t authorized to disclose a private conversation. Trump wasn’t apologetic about the inflammatory remarks and denied he was racist, instead blaming the media for distorting his meaning, the confidant said. Critics of the president, including some Republicans, on Friday blasted the vulgar comments made in the Oval Office. In a meeting with a group of senators, Trump had questioned why the United States would accept more immigrants from Haiti and ‘‘shithole countries’’ in Africa as he rejected a bipartisan immigration deal, according to one participant and people briefed on the remarkable conversation. ‘‘The language used by me at the DACA meeting was tough, but this was not the language used,’’ Trump insisted in early tweets Friday, pushing back on some depictions of the meeting. But Trump and his advisers notably did not dispute the most controversial of his remarks: using ‘‘shithole’’ to describe African nations and saying he would prefer immigrants from countries like Norway instead. ‘‘If that’s not racism, I don’t know how you can define it,’’ US Representative Ileana Ros-Lehtinen, a Florida Republican, told WPLG-TV in Miami. After Trump’s comments were reported, news emerged that John D. Feeley, the US ambassador to Panama, has notified the State Department that he will resign because he believes he no longer can work under Trump. Feeley’s decision was not related to the president’s comments about Haiti and Africa, but the timing of the news about his resignation caused a stir on social media. In December, Elizabeth Shackelford, who worked in Nairobi for the US mission to Somalia, announced her resignation. She told Secretary of State Rex Tillerson that she was quitting because the United States no longer considers human rights a priority. Trump’s insults — along with his rejection of the bipartisan immigration deal drafted by six senators — also threatened to further complicate efforts to extend protections for hundreds of thousands of young immigrants, many of whom were brought to the country as children and now are here illegally. Trump last year ended DACA, which provided young immigrants with protection from deportation along with the ability to work legally in the United States. He gave Congress until March to come up with a legislative fix. On Saturday, Trump sought to blame ‘‘all talk and no ac/tion’’ Democrats for lack of an immigration deal. ‘‘I don’t believe the Democrats really want to see a deal on DACA. They are all talk and no action. This is the time but, day by day, they are blowing the one great opportunity they have. Too bad!’’ Trump tweeted from Florida as he arrived at his private golf club in West Palm Beach. It was unclear now how a deal might emerge, though both sides insist the clock is ticking. Failure could affect government operations.